You’ve heard of fire sales. 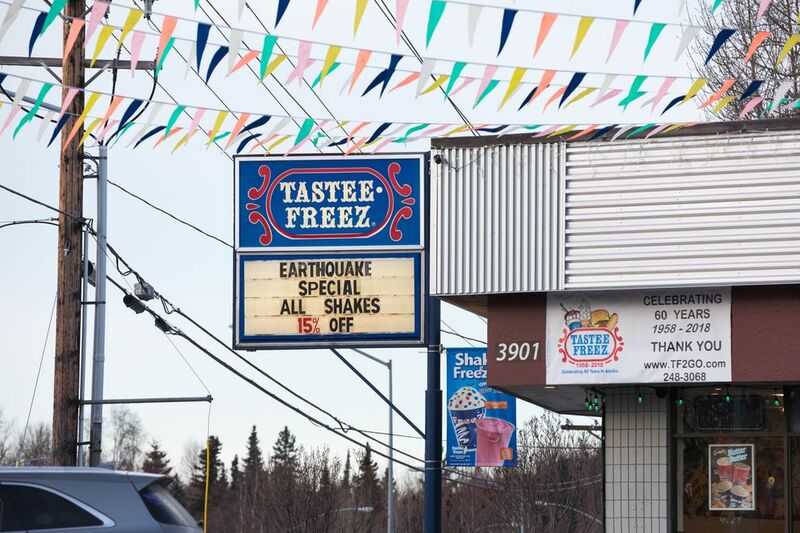 Anchorage stores are having earthquake sales. 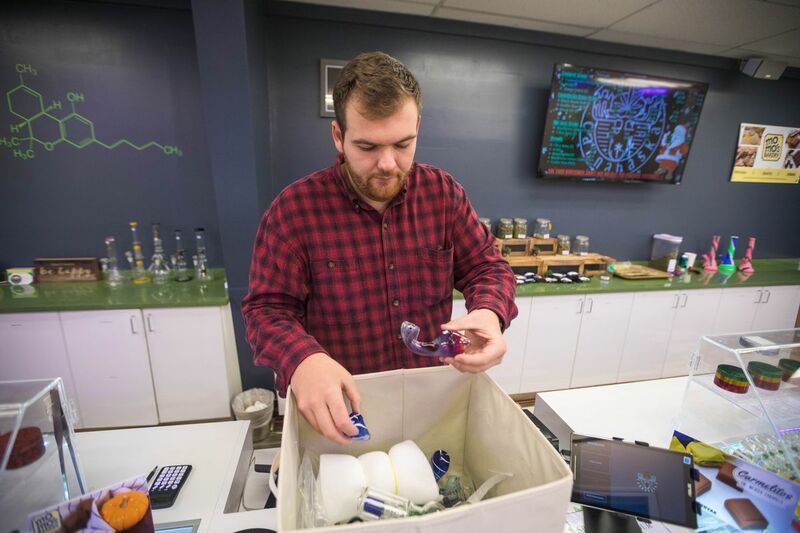 After the magnitude 7.0 earthquake violently shook the Anchorage area on Nov. 30, a general manager at a marijuana shop started hearing from employees. “All the employees texted in like ‘R.I.P. to my bong,’” said Jake Warden of Cannabaska on West Tudor Road. Then he had an idea. Bongs and pipes would be shattered all over town by the quake, he figured, so the store texted customers alerting them to a sale. That day, Cannabaska brought in almost as much money as it did on Black Friday, Warden said. Across Anchorage, retailers tried to make the best of the quake’s aftermath, selling damaged goods at a discount or just seizing the opportunity to get customers in the door. At Title Wave Books, thousands of volumes knocked off the shelves are now just $2 apiece. One store sold dented water bottles to shoppers across the country. Cannabaska loyalty members got that text at about 10:30 a.m. Friday. It said: “Lose a bong in the earthquake? We got you! 30% off ALL GLASS today @ Cannabaska! We also have a bit of shake left if you hurry ;)." There wasn’t much damage at the store, Warden said. He wanted to give a break to people who might be out searching for replacement glassware. At AK Starfish Co., a clothing shop on East Dimond Boulevard, about 140 water bottles got dented and scraped in the quake. People asked on the store’s social media posts whether the shop would put the banged-up bottles on sale. Owner Marci Nelson decided to call it the “Quake Collection” — $7 off, in a nod to the quake’s magnitude. “That became a thing,” said Nelson. “People are calling now for the Quake Collection." In just a day, she said, the shop sold 110 of the water bottles all over the country. “It was memorabilia, and the bulk of the comments were ‘We love you guys, we want to support you, please send the dented ones,’” Nelson said. 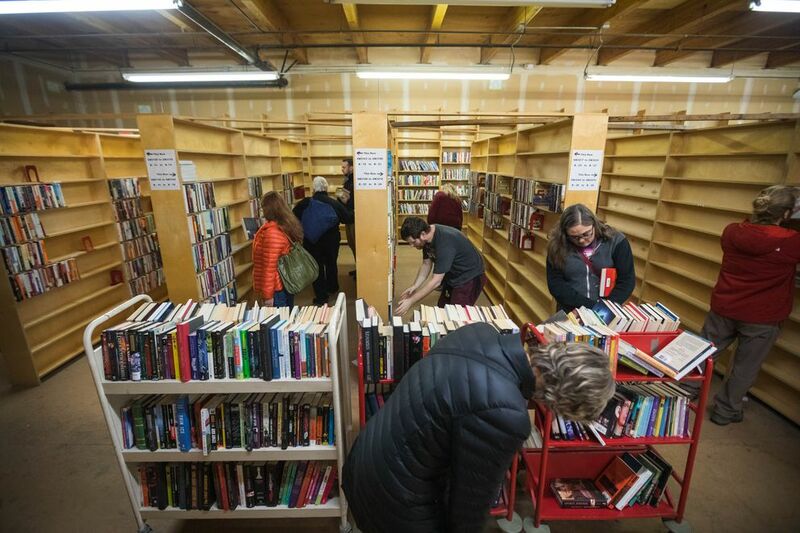 Thousands of used books fell to the floor at Title Wave Books in Spenard. The piles were shin high, said owner Angela Libal. The store’s upstairs warehouse had an overstock inventory of about 13,000 books when the shaking hit. Libal decided to run a sale — $2 each for warehouse books, 11 a.m. to 5 p.m. daily — to minimize the expense of getting them back in order. “Like, OK, don’t even worry about what order they’re in, just get all the books up on the shelves, spine-out, and then we’ll open it up to the public,” Libal said. The sale started Saturday, and the store had sold 8,900 of the books by Wednesday morning. “It is bananas up there at the cash registers,” she said. “Shaken, not stirred,” the post said. Sixth Avenue Outfitters Co-Op downtown is having a “shake out" sale through Monday, with discounts on water bottles, footwear, down parkas and more. The store’s dropped ceiling fell during the quake, scattering dust and debris all over, said finance director Kate Mauldin. At Cannabaska, Warden said the plan is to donate 10 percent of the money it raked in from its sale to an earthquake relief effort. Some items at AK Starfish Co. couldn’t be salvaged, like more than 100 candles in glass holders that got smashed to bits. Especially at the height of holiday shopping season, broken and scuffed merchandise caused Nelson some panic before she realized the demand for a sale. “We don’t have time to get replacements. What do we do? So it ended up being a good move,” she said. Then there are the earthquake sales that have nothing to do with damaged goods. Mammoth Music on East Fifth Avenue in Anchorage has a 7 percent discount this week on pedals from a brand called EarthQuaker Devices. Admission to the Anchorage Museum is free through 9 p.m. Friday, said museum director Julie Decker.